Owen Sound, Ontario, artist and author Elly MacKay caught our eye with her debut picture book, If You Hold a Seed (Running Press Kids/PGC) in 2013. Since then, MacKay has kept busy, releasing her second book, Shadow Chasers, last year, and lending her unique illustrations to titles by other authors (Fall Leaves by Loretta Holland) and cover images for new editions of L.M. Montgomery’s Anne and Emily series, published by Tundra Books last fall. 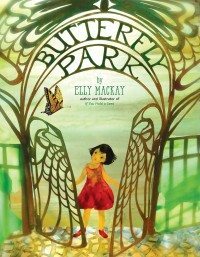 MacKay’s art, which combines painted cut-paper elements and photography, is on stunning display in her latest title, Butterfly Park (Running Press/PGC). The story is simple and sweet: a young girl moves to a new home in a busy city, and is dismayed to find a distinct lack of butterflies in the park adjacent to her house. Spotting a few of the winged beauties outside the park gates, the girl decides to follow them, collecting a troupe of neighbours along the way. When they catch up with the butterflies, they discover the one thing missing from their local green space: flowers. Banding together, the newly acquainted residents fill Butterfly Park with blooms, butterflies, and laughter. The feel-good messages of enjoying nature, rehabilitating under-used green space, and community-building are presented organically in the story, which moves at a pleasantly even pace. But the real treat here is the art. MacKay in in top form, and readers will delight in the mix of colours, textures, and perspectives she employs in creating the visual elements of this lovely book.